OrangeJuice’s main goal was to create a first person Real-time strategy game (RTS). It was one of my first attempts at creating a game using LWJGL (Java binding of OpenGL). The name comes from the game’s main resource, orange juice, resulting from messing with colours when trying to render water. 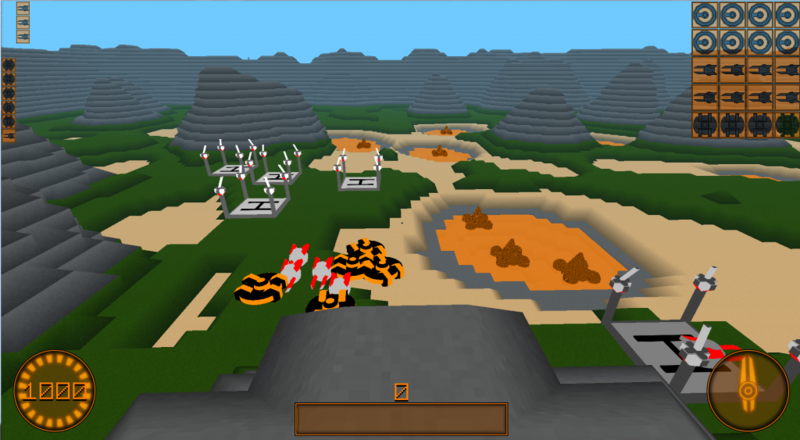 The game was often compared to Minecraft by friends as it used a blocky art style at the beginning. The main intention behind this was to be able to render large/open generated worlds without having to deal with “real” (heightmap) terrain. Some time later a friend of mine, Neroxis (neroxis.net), wrote some very complicated code (lot’s and lot’s of `if` statements, tons of edge cases) that created diagonal edges creating more of a fluent terrain like style. All models and textures were created by him aswell.